Next tour: Sunday 23 June 2019. 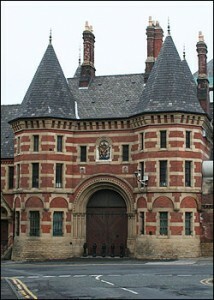 Booking: If you’d like to go to Strangeways, the law will help you get there. Alternatively, just turn up at the above place and on the right date and we’ll take you. Oh, alright: Press here to book with eventbrite. Bring: Bucket for slopping out. End: Somewhere near the governor’s office. Strangeways. The very name enough to send a frisson of fear down the spine of the even the most hardened felons. This is the prison where a hundred people found themselves dangling at the end of a rope (until 1964) and where the inmates rioted voraciously in 1990. But it’s not just a prison, Strangeways is the area north of Victoria Station, colonised by immigrant Jews in the late 19th century whose one-time presence can still be spotted by the eagle eyes and whose community was overlooked by the minaret-shaped prison tower (designed that way by a rather naughty Alfred Waterhouse). Escape with us around its darkest corners for a less than a whole life tariff.